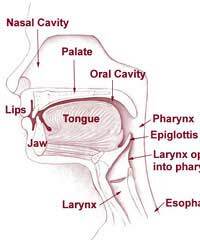 Pharyngeal cancer, or cancer of the pharynx occurs when a cancerous growth develops in the area that extends from the back of the nasal passages down through the throat to the beginning of the oesophagus which is the passage that leads to the stomach. It is more commonly found in men and is a greater risk to smokers and those who drink large amounts of alcohol. Like many forms of cancer, the cause may remain unknown, especially in those who do not smoke or drink alcohol as these are the greatest risk factors. The first symptoms of pharyngeal cancer may not be too noticeable as they are often very similar to those experienced when we have a head cold, a cough or a chest infection. The tumour may cause a sore throat and any sore throat that continues for more than a few weeks even when using the normal remedies should be assessed by your GP. The chances of it being a cancer however are rare and there are many other complaints that could account for a prolonged sore throat. Other common symptoms include feeling as though there is something in your throat, difficulty swallowing, needing to chew for longer to be able to swallow food and finding you are coughing more frequently as you try to clear your throat, often producing more phlegm than normal. If the tumour is quite large, you may find it increasingly difficult to swallow and in a small number of cases, a noticeable growth may be visible in the throat when examined carefully. If the tumour has encroached on a nerve you may find you have pain in the ears, head or jaws and it is possible that your lymph glands in the neck will swell as they try and fight off illness. Cancer of the pharynx may be treatable using surgery, especially if the tumour is contained and hasn’t spread. An operation to excise (cut out) the tumour can be offered, and though this may be all that is needed, may leave the sufferer with some scarring or alterations to the size and shape of the mouth and throat. Though these can often be lessened using grafts from other areas of the body and from having input from a surgeon with a specialist interest in plastic surgery. It is also possible that your surgeon will want to remove a sample of your lymph glands or surrounding tissue to determine if the cancer has invaded other areas. Chemotherapy may be offered, either before the surgery to try and reduce the size of the tumour, or afterwards to ensure that any remaining cells are not left in situ. Radiotherapy can be used, commonly before and after surgery and this involves aiming very high powered x-rays beams directly at the site of the tumour which destroy the affected cells. For some a course of radiotherapy may be sufficient treatment whilst others may benefit more from a combination of all three. The size and location of the tumour may influence the treatment that is planned for you. Pharyngeal cancer is quite rare in those who do not smoke or drink alcohol, nevertheless, any persistent symptoms such as those mentioned should be assessed by your GP to rule out any serious illnesses. Gum Cancer: How Common is It? Re: Can You Still Get Quinsy? Re: Could Cow's Milk Be Causing My Throat Problems? Re: White Lumps From Throat in Mouth: What Are They? If I exercise the next day after drinking alcohol I get a burning in my chest. If I don't drink the day before exercise I'm fine.